If you want to buy cheap sampdoria shirt for 2018-19 season, buy it here in cheap-football.com , Check our exclusive range of sampdoria Football Shirts / Soccer Jerseys and Kits for adults and children at amazing prices. 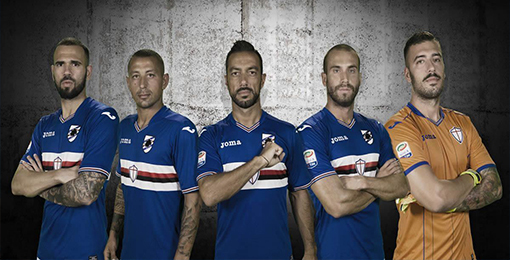 Get the cheap sampdoria jersey shirts, soccer kits with wholesale price, Free Shipping Worldwide! Sampdoria is an Italian association football club based in Genoa. Sampdoria currently competes in Serie A.The club was formed in 1946.Sampdoria have won the Scudetto once in their history, in 1991. The club has also won the Coppa Italia four times, in 1985, 1988, 1989 and 1994, and the Supercoppa Italiana once, in 1991. Their biggest European success came when they won the Cup Winners' Cup in 1990.